How PC Power Supply Replacement Makes You a Better Tech. After all, can you really call yourself a tech if a dead PC baffles you? Sure you can but don’t you want to amaze your friends and significant other that you are the master of dead PCs. One of the easiest diagnosis for a PC is the dead power supply. 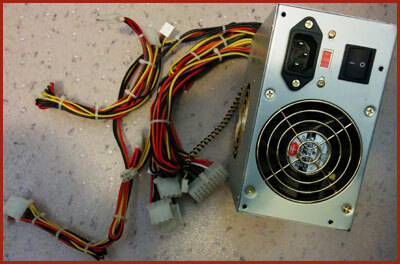 If you have no lights or fans running then either you power is bad or the power supply needs to be replaced. Plug something else into the power outlet to confirm that you don’t have issues with your source. If you have an issue with the power source then find another source. It’s likely that the source has a breaker somewhere. If not then you may need to troubleshoot your wiring. The most obvious problem with a power supply is the switch. Sometimes these inadvertently get tripped when moving the PC. If your power source is good, the power supply is switched and you still have power problems on the PC you have a “dead” power supply. Replacement is not difficult just note where all the cables are connected or better yet take pictures. Unplug the PC from the power outlet. Remove the bolts attaching the power supply to the case and carefully disconnect the cables. You may have to remove tie raps to get the cables loose. Take the power supply with your to your favorite computer outlet & have them find you a suitable replacement. It’s OK to get a higher wattage supply but not a lower one. Plug in the cables the same way you took then out & fasten the supply to the case wit the bolts you removed. Make sure there is no loose cables and power up. Ensure that all drives, CDROM/DVD, show up in Windows Explorer (click start, Computer). After you have replaced the power supply be sure to invite friends over to be amazed. Most will have never seen the insides of a Pc so you are on the good ground here. Seriously, it’s always satisfying to repair something that others think are unrepairable. It’s up to you if you reveal how simple the fix is or demand the rest of the day off.